[Y]ou’ll want to see a market confirmation. That starts when one of the three major indexes begins to rally. That’s day one. Next, wait two days. The market often needs time to digest its initial gains. Make sure the index doesn’t undercut its low. If it does, start counting over again. Starting on day four of the cycle, look for a follow-through session. That occurs when the Dow, Nasdaq or S+P 500 jumps at least 2% on higher volume than the previous day. Ideally trade will also exceed its 50-day average. The bigger the price and volume moves, the better. The strongest follow-throughs occur between days four and seven of the attempted rally. Follow-throughs after the 10th day become less significant. With that in mind, let's look at the market pattern using the O'Neill follow-through criteria. 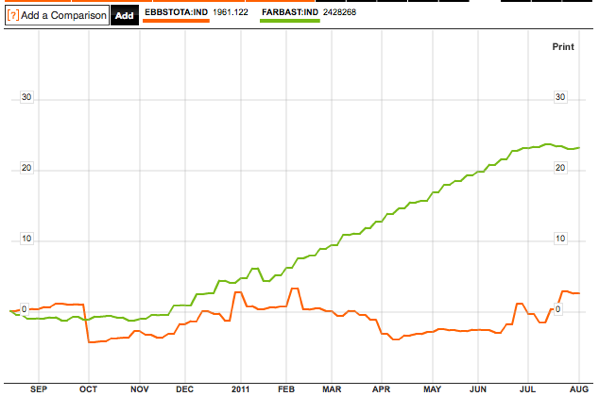 Here are the charts for the major average ETFs. First, let's look at SPY. Day 1 of the rally, according to the above, was August 23. On August 29 (day 5), we had a rally of over 2%, but it was not on "higher volume than the previous day". What about the NASDAQ? Here is the chart of QQQ, which shows a similar pattern of a low volume rally on August 29. The SPY just kissed the bottom of the Fibonacci retracement level on this rally today (Wednesday). As you can see from the RSI chart on top, this market is no longer oversold but sport a neutral reading on RSI. Given these non-confirmations, I would at least be hesitant to go long here but regard the current ﻿levels as an opportunity to lighten positions. Despite the big rally in stocks on Monday, some things aren't quite adding up for me. Let's discuss the problem regions one by one: the United States and Europe. It is now urgent for investors to recognize that the set of economic evidence we observe reflects a unique signature of recessions comprising deterioration in financial and economic measures that is always and only observed during or immediately prior to U.S. recessions. These include a widening of credit spreads on corporate debt versus 6 months prior, the S&P 500 below its level of 6 months prior, the Treasury yield curve flatter than 2.5% (10-year minus 3-month), year-over-year GDP growth below 2%, ISM Purchasing Managers Index below 54, year-over-year growth in total nonfarm payrolls below 1%, as well as important corroborating indicators such as plunging consumer confidence. There are certainly a great number of opinions about the prospect of recession, but the evidence we observe at present has 100% sensitivity (these conditions have always been observed during or just prior to each U.S. recession) and 100% specificity (the only time we observe the full set of these conditions is during or just prior to U.S. recessions). This doesn't mean that the U.S. economy cannot possibly avoid a recession, but to expect that outcome relies on the hope that "this time is different." On top of that, you have the effects of Hurricane Irene. I happen to have a personal interest as we still have an interest in a recreational property in Greene County in upstate New York, which was hit badly by Irene. Consider this picture from Greene Country of the devastation below. Then I got to thinking - Greene County is one of the poorest counties in New York State. Chances are most of the losses are localized and manageable, but given this recent CNN poll indicating that only 36% of Americans can handle a $1,000 emergency expense, could Irene push an already fragile American consumer further into the abyss? 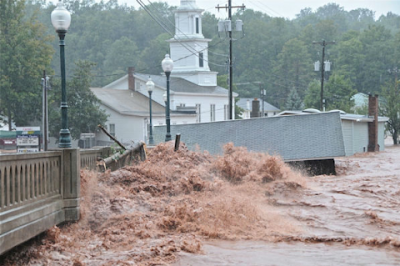 No doubt there will be some insurance and federal aid, but the out-of-pocket loss for many households in upstate New York and Vermont, which are some of the hardest hit areas, will be more than $1,000. (See this link for further details on the damage in upstate New York). The European markets were buoyed Monday by the announcement of a merger between two major Greek banks, with a capital injection from Qatari interests. While such a development is a positive first step, why are Greek 2-year yields still north of 45%? 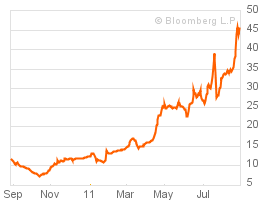 At these levels, the market continues to discount a Greek default. It's a question of when, not if. Following weeks of heavy losses for banking stocks across Europe, the Sunday Times in the UK reported Sunday that European officials are working on a "radical plan" to prevent a fresh pan-European credit crunch. Without citing sources, the paper said officials from the European Central Bank and European Commission are considering offering central guarantees over certain types of debt issued by banks. This is all displacement: no one wants to recognize the losses and write off the debt, yet; not in Europe, (and not in the US, either, as we know well). There’s still too much room to argue about whether it’s liquidity or solvency, and about who should end up holding the bag, et cetera. Round and round it goes. The basic philosophy underlying the Tea Party is, at its crudest: "We're not paying for them". Who's "we" and who's "them" differs across two centuries and across the Atlantic Ocean, but it's still recognisably the same philosophy. The Tea Party makes life difficult for the Lender of Last Resort, because the Tea Party wants some sort of guarantee it will get its money back. And that guarantee can never be made cast-iron. If it could, you probably wouldn't need a Lender of Last Resort in the first place. It's hard deciding these things when there is one central bank governor, one finance minister, and one country. With 17, it's a lot harder. As I have said before. Mish says it's "17 veto points". In my last post entitled "Not too late to buy the long bond", I wrote, "In the absence of policy intervention, the path of least resistance for equities is down." I don't see any developments here that indicate anything that changes my views. Have you seen the plastic smiles on some people? Their lips are smiling but the body language from the rest of the face say something else - the smile isn't genuine. That's what seems to be happening with the equity market right now. Here is the plastic smile in the form of the VIX and short-term sentiment indicators. The VIX Index spiked to over 40 - which is a sign of panic in the markets. In the past, such levels have marked intermediate term turning points for stocks. In addition, short-term investor sentiment is in bearish territory, which is contrarian bullish. While sentiment indicators are bearish and therefore flashing a contrarian bullish signal, my cross-asset analysis is asking "Where's the fear in the rest of the market?" When you read the headlines, the concerns that equities face today are a combination of a US recession and a European banking crisis. But if there were truly fears of a recession, then the prospect of slowing demand should cause commodity prices to go into freefall. Today, commodity prices are in a controlled downtrend but they aren't in freefall as they were in 2008. If the markets were fearful about a European banking crisis, then the logical safe haven of choice of any size would be US Dollars. Today, the USD hasn't shown any great inclination to rally as they did in 2008. If this is a plain vanilla correction, then a buying opportunity is likely at hand. But if we are about to enter a recession, then there will probably be another year of market weakness to endure. If there is a recession ahead, and it does look as though the odds of one are rising inexorably, then take note that only 27% of bear markets occur prior to the first month of economic contraction (in terms of the total decline from the pre-recession highs). So no matter how much the market anticipates, it is never enough at the onset - the bear phase is only a bit more than one-quarter done by the time the recession tide washes ashore. What if wasn't just any ordinary recession but a (European) financial crisis that topples the global economy into a recession, just as we saw in 2008? If we were to look at 2008 episode as an analogy, then where are we? 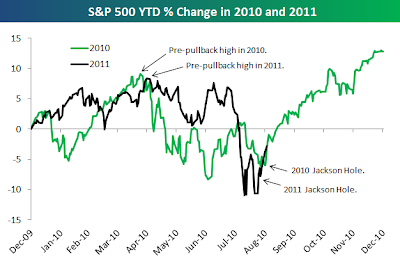 ﻿In early 2008, stocks broke down out of a long multi-year uptrend on high volume (first circle). Stock prices then rallied and then weakened, with the $147 oil price marking the final top before the waterfall decline into the AIG-Wachovia-Lehman Crisis low. Today, stocks have broken down from an uptrend dating back to the March 2009 bottom on high volume. If this were to be a repeat of 2008, could the market only be at the first break similar to the one seen in early 2008? History doesn't repeat itself, it rhymes. The difference between 2011 and 2008 is that commodity prices have already topped out (see previous chart). The truth is probably somewhere in between. If this were 2008, my best guess is that we are probably somewhere between one-third or halfway through the decline. The European banking system is very fragile and any minor breeze could make the whole structure topple. As Bruce Krasting pointed out, it took Drexel ten days to go under once the firm lost its funding sources. Already, the story that the ECB is tapping the Fed's USD swap lines is a serious sign of stress. How long would it take if a second or third tier European bank to go under if it got into trouble? (Less than ten days, I'll bet.) If a small bank became insolvent, then what would the contagion effects be? I've said this and I'll say it again. In the absence of policy intervention, the path of least resistance for equities is down. I have also shown that, based on valuation metrics, the downside potential during a panic could be as low as the 2009 bottom. For investors and traders, the safe haven of choice remains USD denominated default-free Treasury assets. Market analysts got excited a couple of weeks ago when they pointed out that the 10-year yield was at the lows set during the Lehman Crisis panic. Looking at the chart, I can see that the 10-year Treasury yield has more downside potential as it remains in a multi-decade downtrend. A target of 1.2% from the current 2.2% level is possible in the next few months. The biggest bang for the bucks remains the long bond. While 10-year yields decline to the 2008 levels recently, the downside potential on long bond yields are much greater. The most recent FOMC announcement that rates would be kept low for another two years was a signal for the market to take on the carry trade - to borrow short and lend long for at least two years. This caused the yield curve to flatten in the short end but steepen in the long end. The downside potential on the 30-year is 2.0% from the current 3.5% level - a much greater capital gains potential of roughly 25% given its higher duration (and therefore higher interest rate price sensitivity of the long bond) compared to the 10-year. Putting it all together, the combination of my analysis of the 30-year yield and the TLT price chart both point to an initial estimate of 20-25% of potential price upside in the long Treasury bond. For non-US investors, the capital gains potential could be even greater as the USD tends to appreciate during periods of crisis. Key risk: The scenario that I laid out depends on the absence of policy intervention, which I believe is unlikely. There is no appetite in the Congress for another round of fiscal stimulus and the Fed is out of bullets. Mohamed El-Erian of PIMCO pointed out that Bernanke said, in essence, that the Fed has done all it could and it's time for Congress to enact policies "that promote a stronger recovery in the near term [which] may serve longer-term objectives as well." Meanwhile in Europe, EU governments are paralyzed by bickering and there is no consensus on what to do. The ECB appears to be too dogmatic to embark on quantitative easing. That's a recipe for disaster. As the news of the Berkshire/Bank of America deal hit the tape, BAC rallied and so did the banking sector. I had written about the systemic risks that Mr. Market was indicating in the banking system, how does this BAC rescue change the picture? The answer is, "Not very much." Take a look at the relative performance of the BKX compared to the market. Notwithstanding the fact that the Buffett rescue was a sweetheart deal (not everyone can get a 6% coupon on preferred shares senior to the common, so that if everything blows up the common shareholders eat the loss first, plus Buffett gets common share warrants as a "sweetener"), the banks have rallied but remain in a relative downtrend. I would like to see the relative downtrend broken and, ideally, a rally above the relative support line (which has become resistance) broken in June. The performance of the Regional Banks, which are less exposed to European sovereign risk, tells the same story. This was a nice rally, to be sure. But it was not enough to change the picture of a banking sector that is deteriorating. Let's see if Bernanke can ride to the rescue, but I am on record as stating that such a possibility is doubtful. Add to the equation the observation that corporate bonds spreads are starting to blow out, Mr. Market is telling us that the systemic risks are rising in the financial system. Until the banks can stage a significant follow-through on the rally on Thursday, I remain of the opinion that a Euro-disaster is still menacing the global financial system much in the same way that Irene is menacing the US east coast. There has been some buzz in the blogosphere about a paper published by researchers from the San Francisco Fed entitled Boomer Retirement: Headwinds for U.S. Equity Markets? In the paper, the authors concluded that, based on their demographic studies, "real stock prices are not expected to return to their 2010 level until 2027". I had written about the effect of demographics on equity market returns before (see Wait 8 years for a new bull). I had referenced a paper by Geanakoplos et al entitled Demography and the long-term predictability of the stock market, where the authors related stock market returns and long-term P/Es. Reading between the lines, they forecast a 1982-style (my words, not theirs) market bottom about 2018. What's the difference between the San Francisco Fed paper and the Geanakoplos paper? We prefer our M/O ratio to the M/Y ratio of middle-age to young adults, age 20–29, studied by Geanakoplos et al. (2004). In our view, the saving and investment behavior of the old-age cohort is more relevant for asset prices than the behavior of young adults. Equity accumulation by young adults is low. To the extent they save, it is primarily for housing rather than for investment in the stock market. In contrast, individuals age 60–69 may shift their portfolios as their financial needs and attitudes toward risk change. Eligibility for Social Security pensions is also likely to play a first-order role in determining the life-cycle patterns of saving, especially for old-age individuals. The San Francisco Fed researchers concluded that stock prices bottom in 2021, instead of 2018 as implied by the Geanakoplos paper. 2018? 2021? What's the difference? These kinds of estimate errors are to be expected in these kinds of long-term demographic studies. As they say, it's close enough for government work. These studies support my technical conclusion that we are likely to see volatile and range-bound stock markets until the end of the decade. I recently came upon a better fundamental explanation of these mult-decade bull phases followed by multi-decade range-bound stock markets. The chart below from VectorGrader shows the market cap to GDP of US equities from 1950 (charts is theirs, the annotations are mine). Note how the bull phases coincided with expansion of the market cap to GDP ratio. The equity market then topped out and then became range-bound, which coincided with a corrective phase in the market cap to GDP ratio, until that "valuation" metric returned to more realistic levels. Today, the market cap to GDP ratio has corrected some of its gains from the highs seen at the NASDAQ peak in 2000, but not entirely. If I were to eyeball the chart, a market bottom around the end of this decade is quite plausible and likely given the current rate of descent of that ratio. During secular bear markets characterized by flat returns, investors need to use dynamic asset allocation techniques such as the Asset Inflation-Deflation Timer model to capture the swings of a flat market. The poll is updated on a weekly basis and the results are released on Mondays. Europe seems to lurch from crisis to crisis and the time between them has shrunk dramatically from months to days. Where does it all end? (See this hilarious account of what's wrong with Europe). Default/restructuring - the banks first take most of the pain, which would result in a European banking crisis that threatens the stability of the global financial system. The ECB goes nuclear with QE - The European Central Bank buys up peripheral debt on an un-sterilized basis to the tune of, pick a number, €1T? €2T? €3T? In this case, the euro tanks and inflation breaks out in the eurozone. Political integration (in addition to economic integration) - National constitutions get changed and a central authority (Brussels?) assumes greater authority over the budgets and policies of individual EU member states. There is little or no political support for this solution and riots would likely break out all over Europe. The strong EU member states, mainly Germany, bears much of the pain for bailing out its partners. One or more countries (Greece? Portugal? Spain? Germany?) leave the euro - There is no mechanism for leaving the euro. This amount to a form of succession. How do you unscramble an omelette? Widespread confusion and chaos would rule in the financial markets and such an event would likely spark a financial conflagration that spreads around the globe. The least costly option, in my opinion, is option 1. Force the bank shareholders and bond holders to take the pain and at the same time nationalize the troubled banks, much like the Swedish approach to their banking crisis of 1991-2 (also see this description of the Swedish solution in the wake of the Lehman Crisis of 2008). 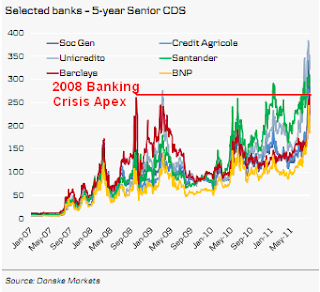 A Euro-TARP for a prepackaged banking crisis? How much would a Swedish style bailout cost? If the EU or its member states nationalized the banking system, the first cut estimate comes from the current market cap of the European banking sector, which is roughly €300 billion. For a more conservative estimate, I considered Tier 1 capital, which includes preferred shares and subordinated debt in addition to common equity. I added up all of the Tier 1 capital of the eurozone banks (ex-UK, Norway and Sweden) shown in the European Banking Authority's stress test of 2010. That figure came to roughly €800 billion. Note that estimate is more conservative because the list of banks include banks which are not exchange-listed such the German Landesbanks. True, there is some problem with this data set. The banking balance sheets does date from December 2009 but I couldn't find the a more up to date table Tier 1 capital and the point of this exercise is not to be exact, but to get a ballpark figure. (If anyone has access to the Tier 1 capital figures from the 2011 stress test please contact me at cam at hbhinvestments dot com). So the ballpark estimate for nationalization ranges from €300 billion to €800 billion. The bill could even be less. During Sweden's banking crisis, not all banks had to be nationalized and some found private solutions. The price of such a rescue campaign is roughly equivalent to TARP, which is very do-able and affordable given the stakes involved. The question is whether the EU member states have the political will to run roughshod over the bankers and financiers to do it. After 40 years of pain avoidance, can we just rip off the f**kin' band-aid already? Enough with the asset price protection, it is the root cause of everything bad about the economy right now. Had we saved the banking system and said f**k the banks themselves, we'd be two thirds of the way out of this by now. Had we gone Swedish instead of Japanese and said the banks are now "Wards of the State" until cleaned up, then yes, we probably would have seen Dow 5000...but so what? Was stopping at Dow 6500 so much better? We would have had an unencumbered financial system at this point, one healthy enough to cope with a new leg down in housing, rather than the debt-ridden George Romero zombie film we find ourselves re-watching every quarter. He was writing about the US economy and how the Fed and the Obama Administration should handle things, but the same comment applies to Europe as well. Banking system like 2008? What about 1998 and LTCM? I wrote about this indicator in May 2011. My own indicator of the BKX relative the the market is now in freefall. There were two occasions in the past when this indicator was in freefall after breaking down through a relative support level. The first time was in 1998 just before the Russia Crisis took down Long Term Capital Management. The second occasion was more benign, as the stock market outperformed the banks during the 1999 run-up to the NASDAQ peak of March 2000. Right now, we have the stock price of Bank of America in a waterfall decline and European banks teetering at the edge. If the real stress in the financial system lies with Europe, which I believe it is, then we have real trouble as the ECB and EU have shown that they are paralyzed and anything that Bernanke Fed announces Friday at Jackson Hole is likely to be a sideshow. Here we go again. Gold has hit all-time highs again. As you can see from the chart below, bullion remains in a well-defined uptrend. On the other hand, gold mining stocks performance is disappointing as the group is struggling with technical resistance and has underperformed gold (again). What happened to the story about a better leverage to the gold price? I wrote about this before here. Gold stocks are underperforming because their cost of production is going up, which creates a headwind for earnings - a driver of stock price. Yes, the value of what they have in the ground has gone up, but so has the cost of what it costs to take it out of the ground. Supposing that you had a crystal ball that told you the price of gold were to triple within two years. Given this piece of information, what should you buy in order to maximize your gain? If you are a gold bull you should either buy GLD or physical bullion, not gold stocks. Last year, Ben Bernanke made a speech at Jackson Hole announcing the start of the Fed's QE2 program, which kicked off a stock market rally. (The Fed throws great parties, don't they?) 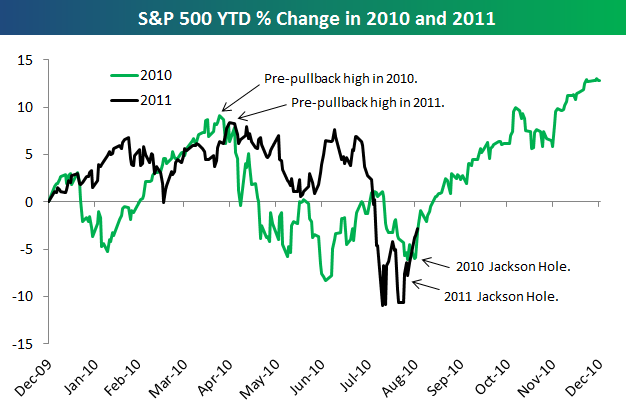 This year, there seems to be a certain level of market expectation that we may see another Jackson Hole surprise. Second, the higher than expected PPI and CPI reports last week are not exactly comforting signals for Fed governors who are concerned about inflationary expectations. At the same time, we have signs of a decelerating economy. This long term chart of the ratio of coincidental to lagging indicators shows that the US economy is definitely in the danger zone. Then we have the awful Philly Fed print last week. David Rosenberg showed this chart of his composite of the Philly Fed and University Michigan Sentiment Index. Need I say more? In the absence of effective policy response, the intermediate term path of least resistance for stocks is down. There have been a number of recent posts about stock valuation with the question of, "How cheap are stocks?" I had posted about bullish data points, most notably from the news that Warren Buffett is buying stocks. Felix Salmon had blogbed about whether stocks are cheap compared to TIPS or corporate bonds. There was also this discussion based on the notion that stocks are cheap according to the Fed Model of earnings yield vs. bonds. I thought that I would do my own exercise of US equity valuation. I decided that rather than consider the forward P/E ratio favored by the Street, where the E tends to be optimistic and analysts can never call the turns in the economy, I focused on a trailing P/E based on actual as reported earnings. Using the data from Standard and Poor's and a history of S+P 500 earnings and valuation, I found that with 94% of the companies reporting 2Q2011 results, "as reported" trailing 12 month earnings for the S+P 500 is $83.75. How much can earnings fall in a recession? The table below goes back to 1960 where were several recessionary episodes when earnings declined. These declines ranged between a low of 7% (for a mild recession such as we saw in 1990) and a high of 30.8%, with a 15% fall as a reasonable guide as to what a "typical" recession might look like. In all of these cases, except for the earnings decline that began in 2006, the peak-to-trough calculation were based on one-year changes in earnings. The first average shown in the table excludes the 2006-7 and 2006-8 years in order to avoid double and triple counting. The average earnings decline excluding the recessionary episode starting in 2006 came to -14.8%. How bad could stocks get in a recession? At the current level of roughly 1200, the trailing P/E ratio using "as reported earnings" is 14.3. If we were to apply that multiple to a 10%, 15% and 30% decline in earnings from current levels due to a recession, we would get targets of 1080 (-10% from current levels), 1020 (-15%) and 840 (-30%) respectively - a simple math calculation. What about a market panic? When the market reached the devil's bottom of 666 in March 2009, it was trading at roughly 10 times trailing earnings. Applying that panic bottom earnings multiple of 10 to the 10%, 15% and 30% earnings decline scenarios would get us 750 (-37%), 710 (-41%) and 590 (-51%). In a worst case analysis, the market could therefore re-test its lows of 2009. Wait a minute, you might say, stocks have already fallen from their peak. Is applying the current multiple of 14 times earnings realistic? The market made its high in early May and the trailing earnings multiple then was 16.9. Applying a 10%, 15% and 30% decline in earnings using a peak multiple of 16.9, which is admittedly an optimistic assumption, gets us targets of 1270 (+6%), 1200 (0%) and 980 (-18%). Given these range of scenarios, my best guess is that US equities are currently discounting a slow growth environment, possibly a very mild recession such as the 1990 episode. A more typical recession is not in the price. If you believe that a recession isn't in the cards, then stocks represent good to fair value. On the other hand, if you believe that there is a serious risk of a recession, then you should be more cautious in your equity allocation. Personally, I am tilting to the bearish side because of growing evidence of a global slowdown. To look on the bright side, should the market panic and re-test the 2009 lows, that's a signal to back up the truck and get long. After my recent posts, examples here and here, I have been accused of overly gloomy, bearish and even Apocalyptic. Today, I would like to present a number of bullish data points as a change of pace. It's always useful to look at the other side of the story, in order to challenge your own viewpoint. We all suffer from confirmation bias, which is the tendency to find data points or news items that confirm our biases. Sentiment is getting so bearish that it has reached the public consciousness, which is contrarian bullish. Insiders are known to be smart investors. Even if they are not trading on material non-public information, which is against the law, their investment activity has on average beaten the market. So the market got very excited when TrimTabs reported last week that insiders were buying at the heaviest pace since May 2008. Others have jumped on the story by reporting that insider buying activity was heaviest in financials, which is bullish for that sector. But TrimTabs cautions that insiders are not infallible. Insiders were also buying heavily in late 2007 and early 2008, right before the financial crisis intensified. Up until right now, all of our businesses have been coming back---even Europe isn't doing that badly---except for businesses relating to home construction which is on its rear end. [Importantly Buffett did say that if events continue like the last few weeks it will change things.] Business has been coming back steadily, even more than the mood of the public. Are stocks really cheap on an absolute basis or are they just cheap relative to bonds? I don't pretend to be as smart an investor as Warren Buffett, but respected value investor Jeremy Grantham of GMO recently wrote that fair value on the S&P 500 is no more than 950. I personally think the Treasury market (NYSE:TLT), the long-dated, are a bubble and it will be one of the worst investments for the longer term if you buy a 10-year, a 30-year U.S. Treasury so I’m a bit puzzled that Treasuries are now yielding, are essentially near record lows. I would rather sell Treasuries. In that case, could Berkshire be issue cheap debt to buy stocks in order to arbitrage the difference in expected returns? When the story gets to the popular mainstream press such as Time, is it time to buy? My inner bear doesn`t have a good answer to that question, other to point to this technical analysis study from Goldman Sachs (ht: ZeroHedge) indicating that when the VIX spikes to the high 40`s, as it did last week, it usually either marks an intermediate term bottom or a sideways consolidation pattern in the market. The report, however, does cite the risks to Europe as part of their forecast. Sentiment analysis seems to be the most compelling from the bullish viewpoint. Given the risks in the system, my best guess is that the market is likely to be choppy but move sideways after this oversold relief rally is complete. A number of regular readers have asked me to update the readings on my Asset Inflation-Deflation Timer Model. The poll is conducted weekly and the current reading is neutral. To promote the ongoing economic recovery and to help ensure that inflation, over time, is at levels consistent with its mandate, the Committee decided today to keep the target range for the federal funds rate at 0 to 1/4 percent. The Committee currently anticipates that economic conditions--including low rates of resource utilization and a subdued outlook for inflation over the medium run--are likely to warrant exceptionally low levels for the federal funds rate at least through mid-2013. 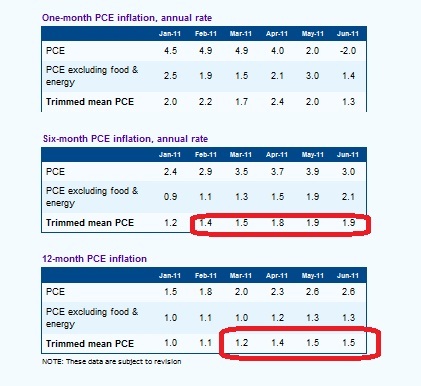 Note that they didn't exactly say that they would keep rates low until 2013, they just said that they "currently anticipate" that they would keep rates low until 2013, which means that they can change their minds at any time - but never mind that. As with last year, there could be another round of fireworks coming out of the Jackson Hole meetings this year when Bernanke is scheduled to speak on August 26. I don't believe that the market volatility last week was the result of the credit downgrade of US debt. Instead, it represents signs of stress showing up in the financial system. I have been writing about the relative performance of the KBW Bank Index (BKX) relative to the market since May (see my original post here). Since then, the BKX has violated a major relative support level. Past violations have been signs of major systemic risk in the financial system coming to light. The first instance was the Russia Crisis in 1998 and the second was 2007 with the Subprime Crisis. Now it's happening all over again when relative support was broken in June. The recent selloff in the markets only intensified the underperformance and the sector remains in a major relative downtrend. What to make of the difference between the BKX, which includes all of the big too-big-to-fail (TBTF) banks, and the KRX, which are regionals more focused on plain vanilla banking? The difference is global and investment banking exposure. The TBTF banks have it and the regionals don't, or have a lot less. The logical conclusion is that the difference in performance in BKX and KRX performance are concerns over a European banking crisis, which the Fed will only play a secondary role in. True, the recent relative breakdown in the KRX is worrisome and likely reflects concerns over a the effects of a slowdown on an already fragile US economy (e.g., see this recent story indicating that 64% of Americans can't handle a $1,000 emergency expense), but it could be a false signal because of the incredible market volatility last week. The biggest macro problem remains Europe. Unless the ECB is willing to back up its new role as lender-of-last-resort with massive purchases of Italian and Spanish debt, it will inevitably be tested by markets. Weak hands will take advantage of rallies to offload holdings onto the ECB, i.e. onto eurozone taxpayers. Frankfurt will find itself underwater very quickly without a legal mandate or EU treaty authority. RBS calculates that the ECB will have to buy roughly half the outstanding tradeable debt of the two countries to defend the line. RBS calculates €850bn. I would put it nearer €1 trillion. This is currently impossible. The ECB is acting as a temporary back-stop until the revamped EFSF bail-out fund is ratified by all parliaments over coming months. The EFSF will then take the baton. Yet as we all know, the EFSF has no money. The parliaments have not even ratified the earlier boost to €440bn. As of today, the fund has barely €80bn left after all the commitments to Greece, Ireland, and Portugal. It remains a fiction. ...and the EU (read: the Germans) are adamantly against forking more euros over to save the Club Med countries. Both the FT and the WSJ are indicating widespread discontent with Angela Merkel over the prospect of more bailouts. Though there was a report over the weekend that the German government no longer rules out euro bonds, it doesn't actually say that they would actually take that step, but consider the option. Moreover, any government that pursues such a policy in the face of widespread popular discontent risks its own tenure in power. Will the ECB throw in the towel and "do QE"? What about the ECB as a white knight? Joseph Cotterill of FT Alphaville recently wrote about the ECB in action in their "rescue" efforts. For newbies, let me explain how the mechanism works. Supposing that the ECB were to buy Spanish or Italian debt. Where does the money come from? One option would be for the ECB to print it (because central banks can print money out of thin air), which is variously described as debt monetization or (horrors!) quantitative easing. If it doesn't want to engage in QE, then it has to issue debt into the market and that activity is termed "sterilization", or "sterilisation", as the Brits would have it. Eventually the ECB also supported Greece, Portugal and Ireland ‘on a massive scale’, holding up to 20 per cent of their respective total debt stocks. If the ECB went on to hold that much of Italy, it would hold about €320bn (Spain €115bn). So we have a problem. Actually, two problems. 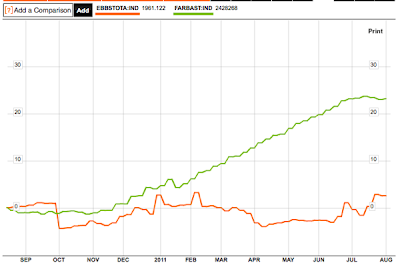 Whether the ECB can sterilise Spanish and Italian bond-buying if they get to a large size, and whether that size will itself become the big liquidity threat to Italian or Spanish bond markets over time as supply is sucked out. Hanging over all of it is the Securities Markets Programme’s long-running tendency to give long investors who want to sell an exit route at a good price, rather than encouraging them to maintain exposure. The mechanism for a rescue in Europe has been the Troika, consisting of the EU, the ECB and the IMF. The IMF is unlikely to take the lead in any crisis unless it's called upon. What's left is the EU and the ECB. Given resistance of the German public to further bailouts, the most likely candidate is the ECB. Will the ECB finally "do QE"? Over to you, Jean-Claude! Given risks of a banking crisis in Europe, anything that Bernanke announces at Jackson Hole is likely to be a sideshow. I reviewed many of the world's stock market charts this weekend and what I found were numerous Dark Crosses where the 50-day moving averaged and crossed under the 200 day-day moving average. These are ominous signs indicating the overall trend has turned south. In fact, most Dark Crosses had occurred in either June or July and US equities were one of the last markets to experience a Dark Cross. In fact, only one stock market, the Russian one, hadn't seen a Dark Cross marking a technical downtrend but it had experienced a pattern of broken support. In this age of rising market correlations, a preponderance of technical downtrends and violations of support levels can't be good news for the bulls. The weight of the evidence indicates that a bear market has begun. Wow! The Fed relief rally that began Tuesday evaporated on Wednesday like the morning dew. Oversold markets can get more oversold and overbought markets can get more overbought. In fact, my former Merrill Lynch colleague used the term "a good overbought" condition to describe an uptrending market or stock that rallied, paused and rallied again. Buy when the market exits the oversold condition. While this method isn't perfect, it avoids much of the draw-downs that come from buying a panicky falling market or shorting an overexuberant bullish market. Warning: This technique isn't for the faint of heart. But if you can stand the risk and want to play a rally here, then wait for the oversold condition to clear itself before entering the market on the long side. As I write this, ES futures are up about 1% so we have a shot that Thursday will be an up day, which would could prove to be the start of a relief rally that typically lasts 1-3 weeks. * For traders who want to monitor the readings of this model on a daily basis, click on this link. The average next-day return is 0.59% (but variability is high). 60% of next-day returns (27 of 45) are positive. The average next-day return is fairly consistent for subsamples when the index is above and below its 200-day SMA. I found similar results, though the sample size was slightly larger at 59 (instead of 45). The next day return averaged 0.36%, which beat the average daily Dow daily return of 0.03% by 0.33%. There was an outlier of -22.6% during the Crash of 1987 which pulled down the average return. If we were to look at the median return, which is less sensitve to outliers, the median daily return on big down days was 0.43%, which was substantially ahead of the Dow daily return of 0.04%. 62.7% of the subsequent daily returns were up, ahead of the 52.2% figure for all Dow days from 1928. Next day returns were highly volatile and the standard deviation of daily returns after big down days was nearly four times the standard deviation of daily Dow returns for the entire sample. CXO Advisory warned against looking at averages of subsequent one-week returns because of overlapping instances of big down days. The table reflects the first instance of a big down day in a five day period and subsequent big down day weekly returns were ignored. Interestingly, while the markets rose for the next day for big down days, the one-week return was not so encouraging. In all cases, the average and median returns, as well as percentage of positive weeks, underperformed our control sample of the Dow returns for our entire study period. Here the sample size grew to 170 from 59. The results were similar but not as strong. The one day return outperformed but the one-week returns were mixed. Remember the market adage about the magazine cover indicator? When a popular magazine (not financial one such as the Wall Street Journal, Barrons or the Financial Times) writes about either the devastation of bear markets or the beauty of stocks, then it's a contrarian sign marking either a top (in the case of exuberance) or bottom (in the case of excessive bearishness). There is no doubt that the markets are oversold. Does the New Yorker cover mark a bottom, even if it's a short or intermediate term bottom? ...the markets are behaving badly as I write this. Asian markets are deeply in the red and ES futures are down over 2%. There is no doubt that markets are deeply oversold, but oversold markets can get more oversold. 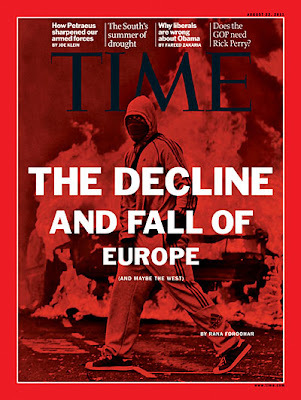 Does the decline get arrested in Europe? Will ECB intervention occur and will that spark a relief rally? How do the financials behave relative to the market? European sovereign risk, as well as the fear of a US double-dip recession, are driving this rush to safety and the financials are one of the most vulnerable sectors of the market. Do the financials outperform or underperform the market Monday? How will the US stock market behave intraday? The markets will be buffeted, on one hand by panic and forced selling from margin calls and risk managers, and on the other hand by short-sellers covering shorts by the day's end just in case the Fed comes out with a market friendly statement on Tuesday. (See my comments here about my assessment of the likelihood of QE3). How does gold behave? As I write this, the gold price has screamed upwards in Tokyo and breached the $1700 mark. If this is truly a risk-off "margin clerk" market, then risky assets like gold, silver, copper and other commodity prices should get hit just as hard. Buckle up. It's going to be a wild ride. Last week, it is dawning on Mr. Market that the US economy is starting to look weak. Last whis week, John Hussman was discussing the signposts for another economic slowdown. Moreover, ECRI was warning about double-dip concerns this summer (note that they are not calling for a double-dip recession, just rising concerns about a double-dip). In addition, three prominent former Fed officials, namely Brian Madigan, Vincent Reinhart and Donald Kohn, called for the Fed to take a second look for another round of bond buying. In view of these worries about slowing growth, is the Fed likely to ride to the rescue with another round of quantitative easing? On the one hand, the possibility remains that the recent economic weakness may prove more persistent than expected and that deflationary risks might reemerge, implying a need for additional policy support. Even with the federal funds rate close to zero, we have a number of ways in which we could act to ease financial conditions further. One option would be to provide more explicit guidance about the period over which the federal funds rate and the balance sheet would remain at their current levels. Another approach would be to initiate more securities purchases or to increase the average maturity of our holdings. The Federal Reserve could also reduce the 25 basis point rate of interest it pays to banks on their reserves, thereby putting downward pressure on short-term rates more generally. Note the two conditions – persistent economic weakness coupled with deflation risks. The latter was a focus when the Fed initiated QE2, with the lack of such risks guaranteeing the Fed would cease asset purchases at the end of June. Bernanke made clear the focus on deflation in his most recent press conference. One of the Fed's most closely watched inflation indicators is Personal Consumption Expenditure, or PCE. The Dallas Fed publishes a trimmed mean PCE series, which is a measure of core PCE, or PCE without the volatile components. While one-month PCE did turn negative in the latest June release, note how trimmed mean PCE has been ticking up in the last few months at the 6 and 12 month level (circled). These figures are at best mixed and not friendly to the initiation of QE3. In addition, Friday's Non-Farm Payroll came in ahead of expectations. Though the headline NFP jobs gain of 117K jobs still indicates a weak economy, it is not showing signs of deterioration (and deflation). The implied inflation expectations from the TIPS market is 193bp and 225bp at the 5 and 10 year horizons, respectively. Still well above last summer's lows. The Fed has repeatedly argued they can't do anything about growth, but can fight deflation. But this doesn't appear to be a strong deflationary signal. This too argues against significantly policy shifts. What about other market based indicators of inflationary expectations? Take a look at the price of gold. In July the yellow metal rallied about resistance at 1,500 and is in a solid uptrend. Is this what deflation looks like? Despite the pain suffered by the financial markets, I don't believe that the Fed will ride to the rescue with a QE3 program in the immediate future. They will undoubtedly act - but later, when the damage is done to the markets and the economy. Understand how Fed governors think. These people are mostly academics, charged with steering the most powerful central bank in the world. Academics are conservative by nature and want to wait for the evidence to come in before acting. After all, you don't want to over-reacting on minor blips in the data, do you? Also put yourself in Bernanke's head. His academic reputation was built on the study of central bank action during the Great Depression. This is probably a little voice in his head telling over and over again, "Don't let another Great Depression happen on your watch." As a result, we have the Bernanke Put. During his economic studies at New York University, Greenspan worked under Eugene Banks, a managing director at the wall street investment bank Brown Brothers Harriman, working in the firms equity research department. From 1948 to 1953, Greenspan worked as an economic analyst at The National Industrial Conference Board, a business and industry oriented think-tank in New York City. From 1955 to 1987, when he was appointed as chairman of the Federal Reserve, Greenspan was chairman and president of Townsend-Greenspan & Co., Inc., an economic consulting firm in New York City, a 33-year stint interrupted only from 1974 to 1977 by his service as Chairman of the Council of Economic Advisers under President Gerald Ford. In the summer of 1968, Greenspan agreed to serve Richard Nixon as his coordinator on domestic policy in the nomination campaign. Greenspan has also served as a corporate director for Aluminum Company of America (Alcoa); Automatic Data Processing, Inc.; Capital Cities/ABC, Inc.; General Foods, Inc.; J.P. Morgan & Co., Inc.; Morgan Guaranty Trust Company of New York; Mobil Corporation; and The Pittston Company. 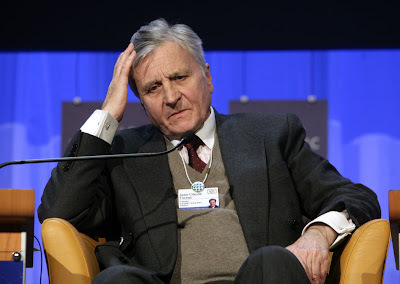 He was a director of the Council on Foreign Relations foreign policy organization between 1982 and 1988. 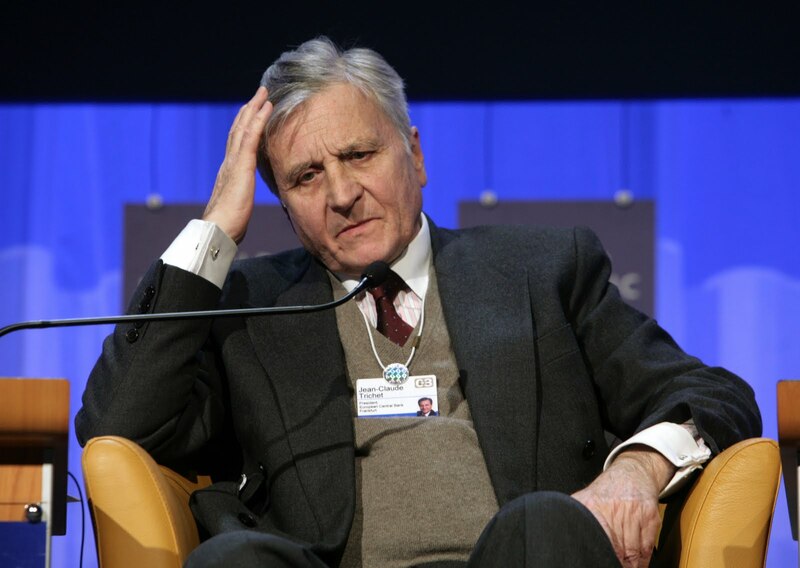 He also served as a member of the influential Washington-based financial advisory body, the Group of Thirty in 1984. Greenspan's approach as Fed Chairman was to stimulate whenever he saw signs of weakness - and he was far more market savvy than Bernanke. Therefore the Greenspan Fed tended to be more proactive and tended to get ahead of events. The Great Moderation was the result of the Greenspan Put - and those policies worked well, until they went overboard with the stimulus (and we are still paying the price for those policies). In essence, that's the difference between the Greenspan and Bernanke Fed. The Greenspan Fed would be acting now with another round of QE as it had a history of getting ahead of market events. The Bernanke Fed is more cautious and will only act when the economic evidence is fully in - which likely means Q4 at the earliest. I don't expect any form of QE to be announced this week. The most we can expect from the Fed is for them to moderate their language to hint that they are allowing for some signs of weakness (which they'll "monitor") and hint at another round of QE. How much more downside from here?